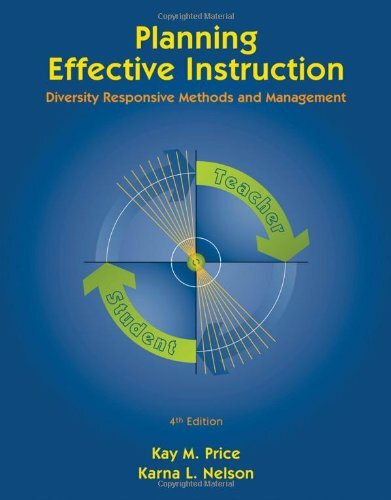 PLANNING EFFECTIVE INSTRUCTION: DIVERSITY RESPONSIVE METHODS AND MANAGEMENT, Fourth Edition, fully equips readers to teach in ways that meet the needs of all students in today's diverse classroom. The four-part organization corresponds with a new framework for diversity responsive teaching that helps focus planning for diversity. Represented by a visual organizer, this framework helps readers see that what they teach, how they teach, and the context for teaching interact to bring about the success of all students. Kay M. Price is a seasoned Professor of Education at Western Washington University. Both Kay and co-author Karna L. Nelson have similar areas of expertise: instructional planning and delivery, emotional and behavior disorders, and teaching social skills. "This is an extremely useful book for all pre-service teachers, and I would highly recommend it. The topics covered in the book and the order in which they are presented provide much needed support for students just beginning to plan for instruction. I believe this is an excellent resource for pre-service teachers and should be required reading. The topics presented are all useful for beginning teachers, and they are presented in a logical and clear cut fashion." "A worthwhile practical book full of easy to follow information that can make all the difference in the world as to whether a student becomes a successful teacher."